Tired of punching at the sky, yelling at the television and unfriending folks from high school because of politics? Of course you are! The current administration’s steady commitment to incompetence, corruption and white nationalists has gotten the American people, especially African Americans, riled up in ways not seen since Chaka Khan performed at the Republican National Convention (yes, that happened). We at The Root really feel for you, and offer a solution to your pain: our new ongoing series, On the Run: 2017 Campaign Edition. Several times a month, we’ll be taking you on a tour throughout the U.S., focusing on African-American candidates running for local office, the statehouse and Senate, mayor or governor ... in other words, the people who have just as much to do with your health care and security as the golf-playing, TV-watching retiree in the White House. These are local races where you can volunteer, give money, support and vent your Donald Trump-induced frustrations at the ballot box this fall. We also want you to participate in the process; this is an ongoing interactive story, so if you’re running for local office or know someone who is, tweet us here or here and we may reach out to you. Our first feature takes us to Virginia, which, according to the state’s motto, “is for lovers” (of all kinds, legally). 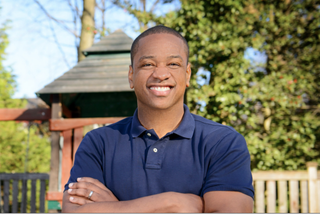 Justin Fairfax is a 38-year-old attorney and graduate of Duke University running for the Democratic nomination June 13 to be lieutenant governor of Virginia. He is currently leading in some straw polls, and if successful this fall, he would be one of only a handful of African Americans ever to serve as lieutenant governor in the United States, not to mention the only African American to hold statewide office in Virginia this year. We talked to Fairfax about his upbringing, his view on politics and why he just can’t stay loyal to one major league team. The Root: Justin, I think you were made in a lab by Democratic scientists looking to make the perfect black candidate for the DMV (Washington, D.C., Maryland, Virginia metro area). You come from the Midwest (Pittsburgh), but you grew up in Northeast D.C. during the worst part of the crack epidemic in the late ’80s and ’90s. You were raised by a single mom who managed to send four kids to college, and you graduated from Duke undergrad, then Columbia Law School. And your last name is Fairfax, which just happens to be the most populous and diverse county in the state. How do we know you’re for real?! Justin Fairfax: [Laughter.] Well, I’m real. [Laughter.] I mean, my motivation for running for office is to pay back a spiritual debt. Growing up, we didn’t have a lot of money. People gave us hope and faith and optimism and a high-quality education. No matter how dark things seemed, that spiritual wealth kept us going. I have a spiritual debt to pay to all those people—my mom, grandparents, neighbors—who poured so much into me. I have to make that story possible for other people. TR: You grew up in Northeast D.C., which used to be a poor and working-class black neighborhood. Now almost nobody can afford to live there. The same thing is happening in Northern Virginia, where the Great Recession and the housing crisis wiped out so much black wealth that almost nobody can afford to buy Grandma’s old row house and flip it for a million dollars. What is your stance on gentrification? JF: It is a huge challenge, and one thing that I’m passionate about. My mom saved up enough money to buy the house across the street from my grandparents, and she still lives there today in Northeast D.C. These homes are going to sell; they sell for a huge profit, and that can increase the intergenerational wealth people have. For 90 percent of American families, a home is the largest investment they’re ever going to make. You only have so many chances to change the trajectory of your family. One of the things that inspired me to run for attorney general four years ago was I saw the housing crisis. I’m passionate about protecting homeowners. TR: What do you think of the Republican House’s new revision of the Affordable Care Act? What can you do in Virginia to assure millions that they won’t lose their health care? JF: I think this bill is a complete moral travesty and reckless fiscal policy. Utah, Kentucky, Ohio—red states have expanded Medicaid, but we can’t. Until we get our districts to reflect our voters, we’re gonna be stuck, and we’re not gonna be able to do the things we need to do. Just to reflect on the gerrymandering thing and policy, all five of Virginia’s statewide officeholders are Democrats. Democrats have won Virginia in the last three presidential elections. Yet in the House of Delegates, 66 out of 100 members are Republican. That’s a supermajority. In our congressional delegation, 7 out of 11 members of Congress are Republican. All this shows you the power gerrymandering can have on policy. As lieutenant governor, I want to fight for nonpartisan redistricting; it might be one of the most important issues of our time. TR: You live in Virginia, you grew up in D.C., but came from Pittsburgh. Who’s your team? JF: [Laughter.] Basketball team is certainly the Wizards. Since I went to Duke, Jordan is the only Tarheel I like, plus we have the same birthday. I’m existentially torn between the Caps and the Penguins. TR: What is your position on the racist name of Washington’s football team? JF: Speaking personally, I personally don’t like the name. But I think we need to keep things in perspective. I think we’re often diverted by issues like this—but I don’t want that to take away from existential threats to our community: health care, criminal justice, mass incarceration. I want to stay laser-focused on people having economic opportunity. With that said, if I owned the team, I’d change the name. TR: Last question: What’s on your phone? What are you listening to right now; what are you watching ? JF: My favorite song right now is from the musical Hamilton. It’s called “My Shot,” and that’s our campaign theme. We don’t want people to give away their shot on June 13. I haven’t had much time for TV lately; I’ve spent over 35,000 miles in a car, but I read a lot. I’m usually reading multiple books at once. On my reading list right now is The Warmth of Other Suns, The New Jim Crow, True Compass by Ted Kennedy and Team of Rivals. TR: Are you serious? That’s like a college syllabus in political science. You really were made in a lab! JF: [Laughter.] I’m almost done. My favorite is When Hell Froze Over; it’s about Doug Wilder’s 1985 run for lieutenant governor of Virginia [Doug Wilder was the first African-American governor since Reconstruction], and A Reason to Believe by Deval Patrick [who was only the second African American to be elected governor in the United States]. TR: Any last words for our readers, and potential voters, out there ? JF: We’re the first major election since Donald Trump’s inauguration. In 2017, Virginia is going to be the place that sparks a progressive wildfire that spreads across the country. I want everyone to be a part of it.